• Incredible bang for your buck! 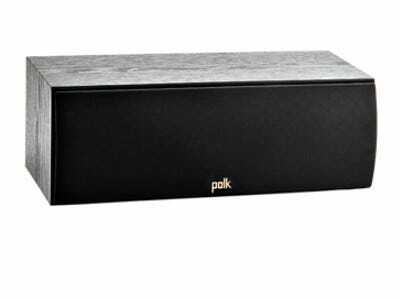 Take your home theatre experience to new heights with the Polk T Series speaker system. Whether you're locked into that brand new action flick or swooning over the latest romantic-comedy, the T Series expands the boundaries of what entertainment should sound like. The T Series is performance tuned to truly amaze. Great sound paired with affordability never sounded this awesome! Built for more than just home theatre use, the T Series also hits the mark on great-sounding audio for your music as well. Playing host and entertaining friends with a solid soundtrack in the background? The T Series has you covered. Unwinding with only your thoughts and that favourite album? Turn up the T Series and let the good times roll! The T50 is not your run-of-the-mill floor standing tower speaker. Just snap off the grill and take a look under the hood - you'll love what you see. With one 1" silk dome tweeter, one 6.25" extended throw composite driver, and two performance tuned front-firing sub bass radiators - all engineered with Polk's proprietary Dynamic Balance technology - highs soar, mids glide uncoloured, and the bass you crave gets a massive boost even at the lowest frequencies. The acoustically-inert, furniture-grade MDF cabinet construction also reduces resonance and distortion, so you get rich, detailed audio the way it's meant to be heard - minus the muffled noise and rattled disruption inherent in low-quality, lesser-than audio equipment. The T30 is the centre channel speaker that puts its overpriced competitors to shame. Since the centre channel is the most important speaker in your home audio system, the T30 is the workhorse that delivers crystal-clear dialogue and room-filling theatre sound. Put the T30 centre channel to the test and you'll hear how it rings true - in price and quality. With one 1" silk dome tweeter, two 5.25" composite drivers, and a performance tuned rear firing bass port - all engineered with Polk's proprietary Dynamic Balance technology - you get crystal-clear dialogue and room-filling sound you'll soon realise you can't live without. The T15 bookshelf speakers are primed to improve your home theatre experience and take on your entire arsenal of tunes without fail. Think brighter highs, a wide-open mid-range and surprising bass response. The best part is that it won't drain your wallet! With one 0.75" silk dome tweeter, a 5.25" composite driver, and a performance tuned front-firing bass port - all engineered with Polk's proprietary Dynamic Balance technology. Designed to produce a wide dispersion sound, setting up your T15 bookshelf speakers is super straightforward and easy no matter where you place them. The Polk PSW111 compact powered subwoofer features an 8" composite woofer that packs a punch larger than its size would suggest - delivering powerful, accurate and musical bass at an affordable price. Specially-tuned, downward-firing port produces maximum bass impact and keeps the cabinet's front profile as sleek as possible. Heavy-duty MDF construction ensures perfect volume and distortion-free low frequencies, while eliminating internal standing waves and performance-robbing resonances.